Mahony and Sons is now the Official Pub/Restaurant Partner of the 2015 Granville Island Turkey Trot, 2015 Fall Classic, and 2016 BMO Vancouver Marathon. Runners will be entitled to receive a complimentary beer provided by Stanley Park Brewery at any Mahony and Sons location for each race they are registered. 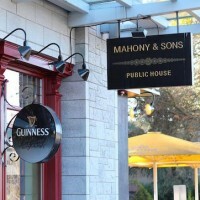 Mahony and Sons, voted Best Pub Fare by Where to Dine Vancouver, will not only provide a free Stanley Park beer, but will also enhance the overall event experience during these races. The restaurant and pub will supply catering at the Finish Line Hospitality Tent, as well host an Exhibitor Night and Charity Reception for the BMO Vancouver Marathon. “We are very happy to continue our partnership with the Vancouver International Marathon Society and expand to all of their races,” says Mike Mahony, of Mahony and Sons. “We are looking forward to rewarding runners with a free Stanley Park beer for all their hard work.” Runners can redeem their Stanley Park beer by simply showing their race bibs at any of the three Mahony and Sons locations for a limited time after each race. Mahony and Sons locations near Stamps Landing, Burrard Landing, and right on UBC campus are conveniently placed close to the racecourses. Runners will easily be able to retain their free beer after the events by simply showing their race bib. The Granville Island Turkey Trot, Fall Classic and BMO Vancouver Marathon all outline the beauty of Vancouver but are unique in their own rights. Runners who participate in all events during the same calendar year are eligible to “Score a Hat-Trick” and receive a special commemorative gift from the Vancouver International Marathon Society.